Check github for the most recent update a few days ago. 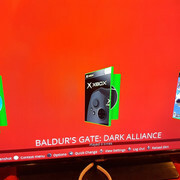 Does anyone know where to get all "opencase" and "dualcover" and "cdposter"? It’s an automated process, if you don’t conform to the norm and have your games outside of the normal games folders on E, F or G. You can add custom paths to the settings.ini file that’s created on first run. THX!!!! Roky5!! I love your job! Or I can do it and send you the skin with th xbe? Thanks a lot for all the help, that all makes sense! Amazing the xbe would be great, the skin I'm happy enough to tweak myself but thanks for offering . Here you go, also redownload and build an update or just copy the new Profiles Skin over to your Xbox and overwrite the old one. 1) Added a new Option to the Skin settings that will disable that profile if Edit mode is disabled. Anyone who still got this xbe i messed up my xbmc4gamer build and want to enable subfolder scan. Remove the file in the Q:\system\toggles\ folder. In the next update there will be a settings toggle in the skin settings menu to do all this instead of files on the HDD. I need some help with this. If someone who is pretty savvy to it could please message me that would be greatly appreciated!! Whenever i try to use the downloader tool i just get a script error : downloader.py has failed. Any fix for this? Never had such problems. 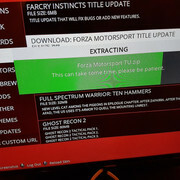 I just updated two of my xbox'es using that script. Your xbox need to have internet connection to be able to download, so check your xbox network ip and set it to dhcp. 12:49:36 M: 55140352  NOTICE: Loading player core factory settings from special://xbmc/system/playercorefactory.xml. 12:49:36 M: 55119872  NOTICE: Loading player core factory settings from special://masterprofile/playercorefactory.xml. 12:49:36 M: 55119872  NOTICE: special://masterprofile/playercorefactory.xml does not exist. Skipping. 12:49:40 M: 45621248  NOTICE: Checking the Date! 12:49:40 M: 45621248  NOTICE: - The Date is Wrong: Setting New Date! Previous line repeats 2 times. 06:00:45 M: 32034816  NOTICE: XBFileZilla: 'FileZilla Server.xml' is missing or is corrupt! Previous line repeats 3 times. 15:58:24 M: 36544512  NOTICE: Loading player core factory settings from special://xbmc/system/playercorefactory.xml. 15:58:24 M: 36544512  NOTICE: Loading player core factory settings from special://masterprofile/playercorefactory.xml. 15:58:24 M: 36544512  NOTICE: special://masterprofile/playercorefactory.xml does not exist. Skipping. 15:58:26 M: 31866880   ERROR: Detection of DVD-ROM media failed. 15:58:26 M: 31641600  NOTICE: | Scripts\XBMC4Gamers\default.py loaded. 15:58:26 M: 31485952  NOTICE: | Nothing to do. 15:58:26 M: 31551488  NOTICE: | Nothing to do. Previous line repeats 4 times. 15:58:30 M: 22298624  NOTICE: XBFileZilla: 'FileZilla Server.xml' is missing or is corrupt! Previous line repeats 11 times. Issue is the value for the skin version, it’s wrong in the skin. Check the language file for the profiles skin and line 18 should be msgid "XBMC4Gamers 1.2.000"
If you can send me or paste the strings.po file here please so I can take a look as you’re the second person to have this issue, the other person built from the source instead of using the prebuilt version. msgid "The playlist is currently empty. [CR][CR]Use the context menu to[CR]add items to the playlist"
msgid "This file is stacked, select the part you want to play from"
msgid "Show Fanart in background"
msgid "Enable auto scrolling for plot &amp; review"
msgid "Enable TV show logo [COLOR=grey2](uses pre downloaded images)[/COLOR]"
msgid "Show recently added videos "
msgid "Show "Now Playing" in background"
msgid "Hide submenus [COLOR=grey2](when unfocused)[/COLOR]"
msgid "Hide in Home Screen"
msgid "Enable Theater in video info [COLOR=grey2](replace trailer button)[/COLOR]"
msgid "Plugin Type/Folder [COLOR=grey2](e.g. Programs/SVN Repo Installer)[/COLOR]"
msgid "Plugin Window ID [COLOR=grey2](e.g. 1) 1=Programs 2=Pictures 24=Video 501=Music 2600=Weather[/COLOR]"
msgid "Disable "flatten" Movies button [COLOR=grey2](title, genres, etc)[/COLOR]"
msgid "Disable "flatten" TV shows button [COLOR=grey2](title, genres, etc)[/COLOR]"
msgid "Show System Resources info"
msgid "Show System Temperatures info"
msgid "Show System Fan Speed info"
msgid "Skin · Region · Screensavers · Display"
msgid "Video library · Playback · Listing options · Subtitles"
msgid "Music library · Playback · Listing options · Karaoke"
msgid "Listing options · Slideshows"
msgid "UPnP/DLNA · Web server · SMB"
msgid "Ouput · Power saving · Autorun"
msgid "Toggles · Scripts · Startup playlist"
msgid "Trainer path · Video switching · Dashboard path"
msgid "Copy · Move · Rename · Delete"
msgid "[B]Load/Add Profiles · Set Media Info · Set Media Sources · Set Lock Preferences[CR]Delete Profiles · Enable/Disable Login screen"
msgid "Applications · DLC · Mods · Update"
msgid "(add items and refresh)"
msgid "Are you sure you want to reset skin settings?" msgid "Individual save directories for each profile"
msgid "[B]Note:[/B] If you're wanting to use [B]XBMC4Gamers[/B] as an application or an individual profile then I would advise leaving the individual saves directories disabled." msgid "Running Scripts, please wait..."
msgid "This game has been played"
msgid "Enable a custom button on the options dialogue"
msgid "Edit Mode is Enabled"
msgid "[COLOR=blue]Enabling this setting will lock this profile if[/COLOR] [B]Edit Mode[/B][COLOR=blue] is disabled[/COLOR]"
msgid "Error Script is missing or is taking to long to finish. Please send me a copy of your [B]"xbmc.log"[/B] file." msgid "[B]User Mode[/B] is enabled[CR]Press (A) to logout." msgid " - [B]Clean[/B] thumbnails"
msgid " - [B]Remove[/B] cached thumbnails"
msgid "[COLOR=blue]Cached upon entering the games menu[/COLOR]"
msgid " - [B]Generate[/B] new thumbnails"
msgid "Welcome. [CR]In this menu you will be able to set up to 5 different birthdays. [CR]These will show on the login-screen when the date arrives." msgid "Hide screenshot and reload skin context buttons"
msgid " - [B]Generate[/B] random playlist"
msgid "Auto login enabled. [CR]You will always login as $INFO[system.profilename]"
msgid "Auto login disabled. [CR]You will be able to select from multiple profiles." msgid "Hide played overlay on poster views"
msgid "Hide trainer overlay on poster views"
msgid "Enable custom xbmc4gamers logo colour"
msgid "Disable fast game parsing"
msgid "Enable alternative synopsis view"
Yeah your skin version in the strings.po is wrong add 3 zeros after the 2. Also did you build this from the source? I don't know if you could help, but I'm trying to have a boot animation/video after the xbmc4gamers splash. Ive put the mp4 in the root of xbmc and tuned on the option in the profile and main settings. But i still get nothing. Mind you i don't get a browse option either. Yup, changed it and it works awesome. I did build from the github using the bat files in the pack I downloaded. I also tried the DLC downloader, but i cant get it to work. 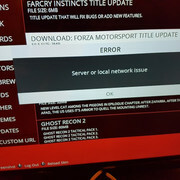 First I thought it had to do with with me not getting any savegames yet, so made a savegame for Forza Motorsport, but I still get the same error. Never argue with an idiot! First he brings you down to his level, then he beats you with experience.